MOSCOW, January 14. /TASS/. Russian President Vladimir Putin and Japanese Prime Minister Shinzo Abe will hold talks in Moscow on January 22. 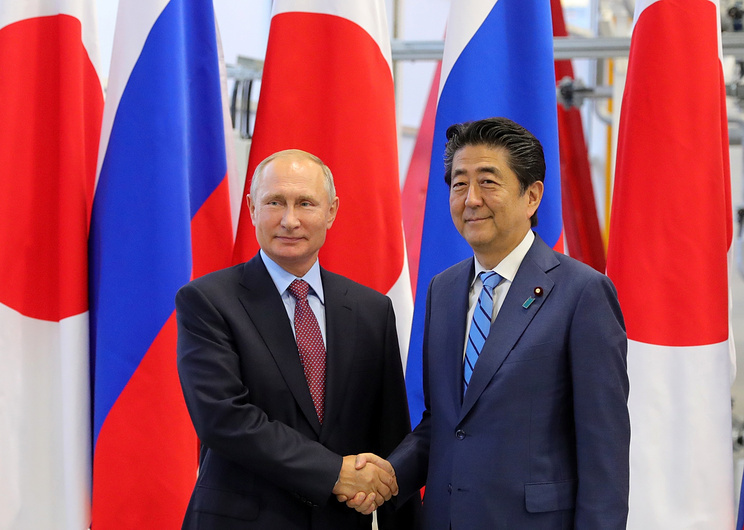 The conclusion of a peace treaty between Russia and Japan is expected to be discussed, the Kremlin’s press-service said. "There are plans for discussing the current condition of and prospects for developing bilateral cooperation in the political, trading, economic and humanitarian spheres. In the wake of the agreements concluded at the previous meetings in Singapore and Buenos Aires questions related with the conclusion of a peace treaty between the two countries are expected to be discussed. There will be an exchange of opinion on certain crucial issues on the international and regional agenda," the press-service said. Abe will be in Russia on a working visit at the Russian president’s invitation. Putin and Abe made a decision to step up negotiations on a peace treaty in Singapore last November. The two sides agreed to use as the basis the joint Declaration of October 19, 1956, which terminated the state of war between the two countries and restored diplomatic and consular relations. In Article 9 of the Declaration the Soviet government agreed to hand over to Japan the Island of Shikotan and a number of small uninhabited islands of the Lesser Kuril Chain on the condition their actual transition to Tokyo would occur only after the conclusion of a peace treaty. The declaration was ratified by the parliaments of the two countries on December 8, 1956. In 1960, in retaliation for the conclusion of the Japanese-US security treaty the Soviet Union annulled its pledge to hand over the islands to Japan. In the memorandum of January 27, 1960 the Soviet government said that Japan would have the islands only on the condition of the pullout of all foreign troops from its territory.